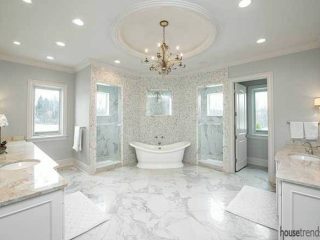 The painted cherry cabinetry featured in this master bathroom is accented with a light glaze and features carved legs and crystal hardware. 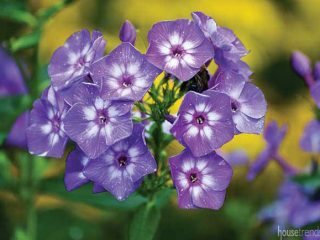 Juggling a successful business as well as three children and their busy schedules usually leaves little time for respite and relaxation. Now Rob Kozel is preparing for another chapter in life as he welcomes his fiancé, Dawn, and her two children into the fold. 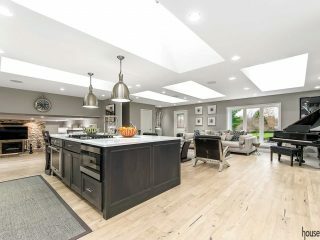 Rob turned to Thomas Trzcinski, CMKBD, president of Kitchen & Bath Concepts of Pittsburgh, to help him remodel the majority of the home, including the dated and cramped master bathroom. 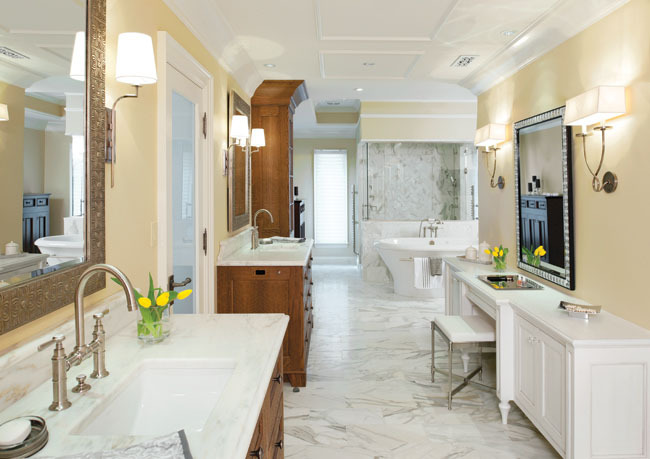 The master bathroom offers a good mix of masculine and feminine qualities. The elegant makeup counter resembles a piece of furniture, bringing a soft touch to the room. 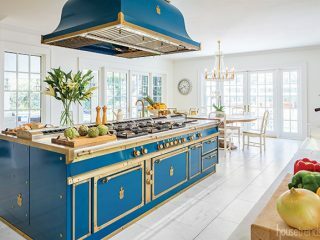 The painted cherry cabinetry is accented with a light glaze and features carved legs and crystal hardware. 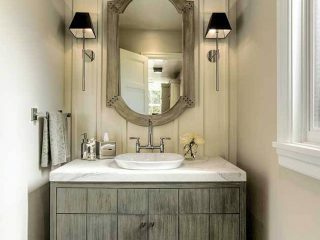 The vanity mirror, curvy wall sconces and sleek stool complete the overall look. The vanity was also strategically lowered to 30-inches to accommodate Dawn’s needs. To bring natural light into the space, a pair of windows was added along the back wall behind the shower. 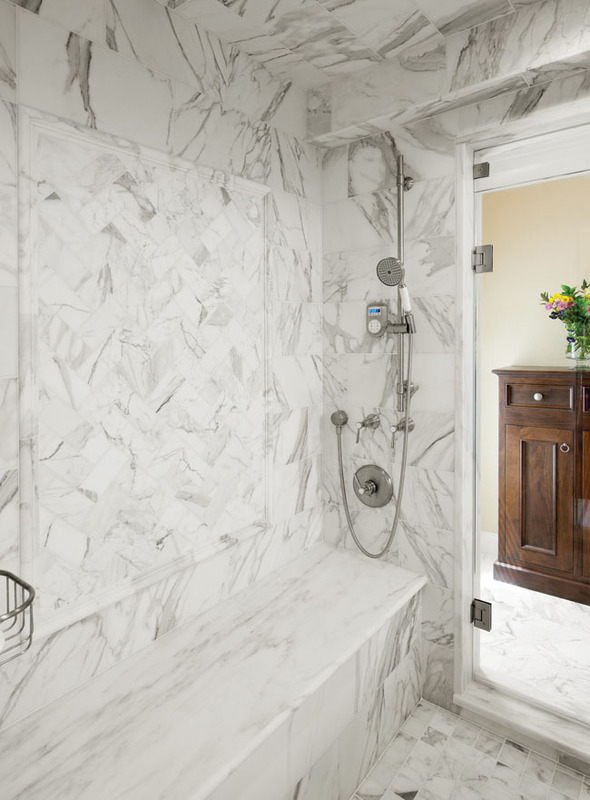 His-and-hers mid-height stained walnut cabinets were placed on each side of the shower to hold towels and other necessities. Rob and Dawn often exercise each morning before they get ready for the day. 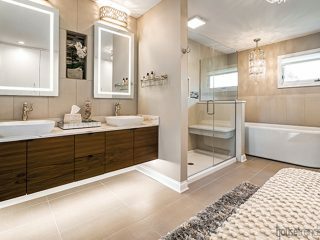 At the entrance to the bathroom is a convenient morning area that strategically hides a pair of pullout refrigerator drawers and a built-in coffee bar tucked behind the mirrored cabinet. 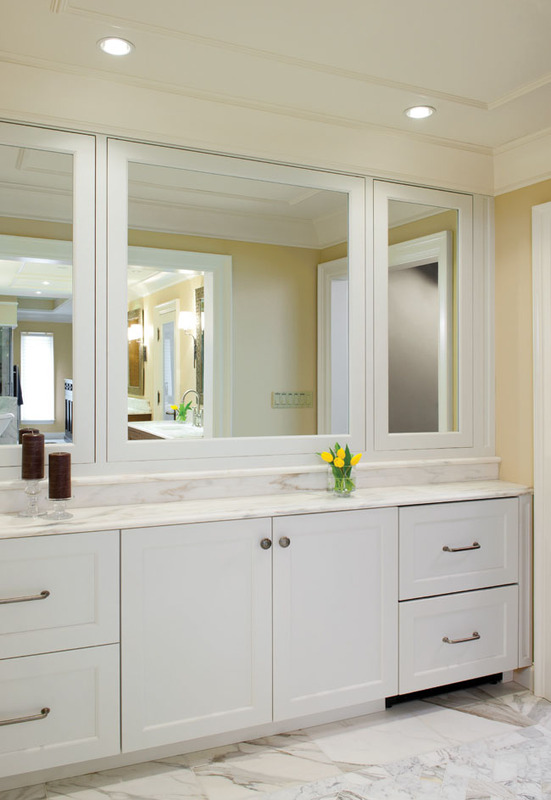 The white painted maple cabinet also provides extra counter space and large mirrors. 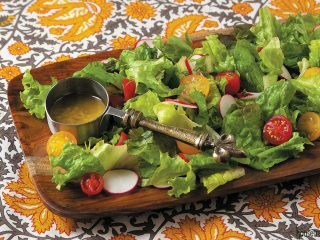 “It is nice to be able to grab a bottle of water before a workout or make a fresh cup of coffee while we’re getting ready for the day,” says Rob. 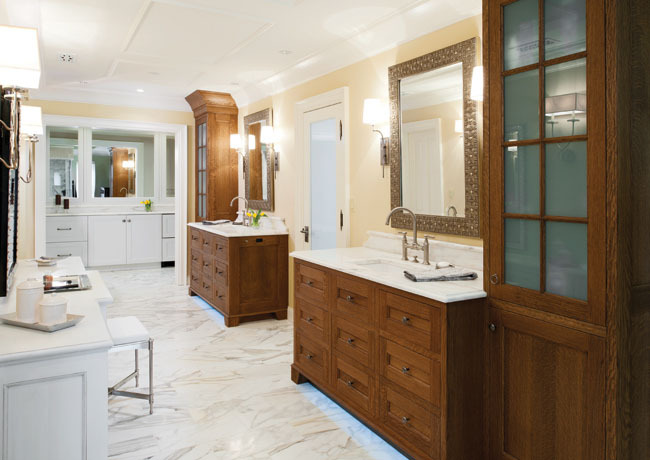 The separate his-and-hers vanities feature stained white oak cabinet bases topped with Imperial Danby marble and undermount Kohler sinks. 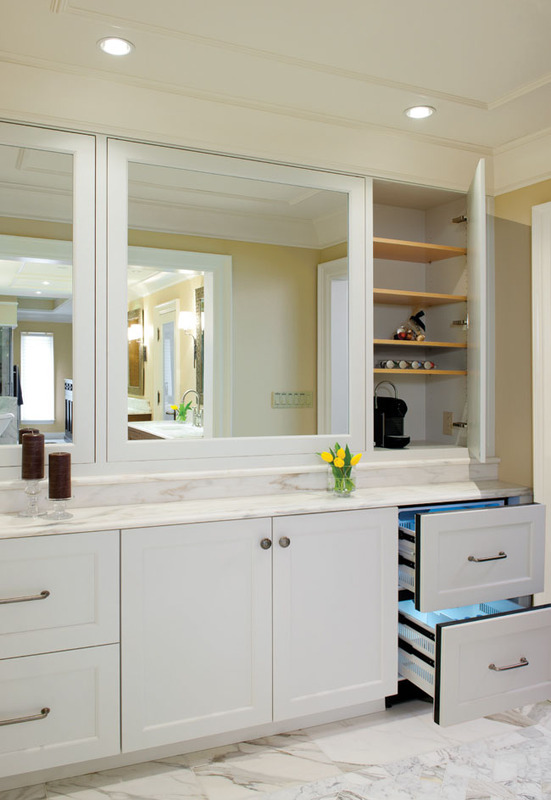 Each vanity also includes a floor-to-ceiling glass-front cabinet for extra storage. 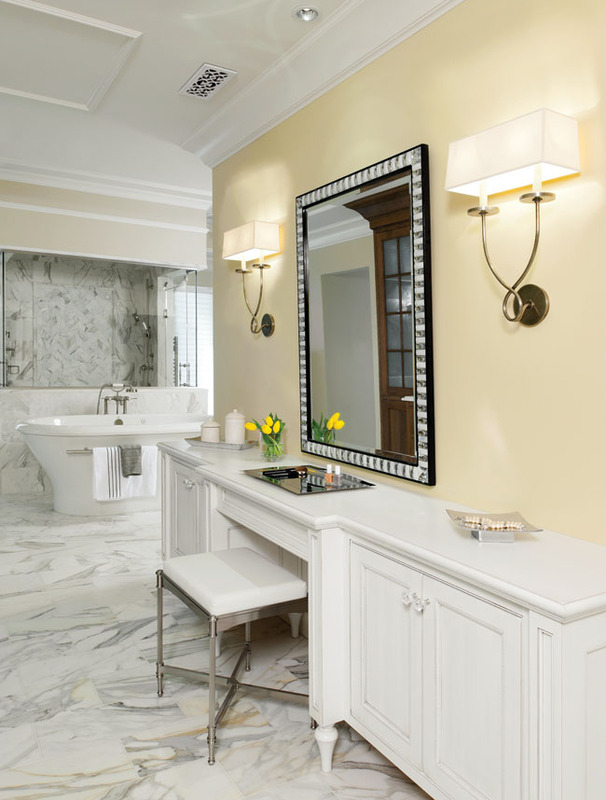 The dark stained cabinetry provides a nice juxtaposition to the lighter tones of the marble floors and walls, which help to establish the clean and bright atmosphere Rob had desired. Molding and trim detail were installed overhead in order to give the impression of taller ceilings.